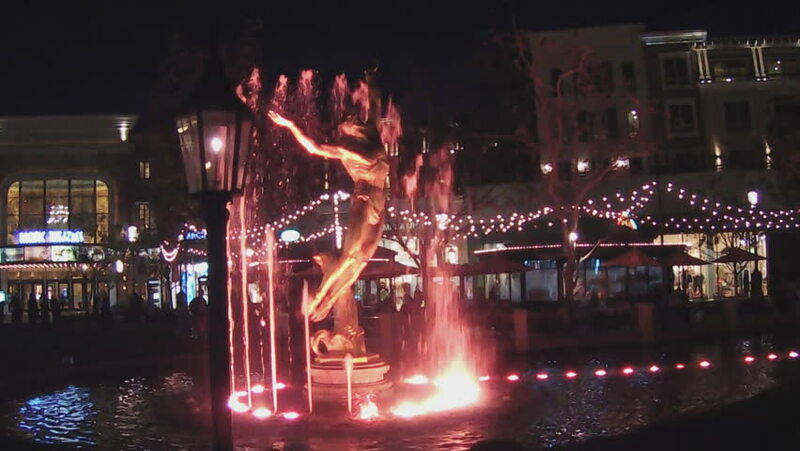 GLENDALE, CA/USA: February 21, 2016- A colorful ring of water jets dance around a golden statue of Prometheus at night. Fountains are used to enhance shopping experience at The Shops At Brand. hd00:12Beijing, China - June 2010: People in Wangfujing night food market in Beijing, China. hd00:13GLENDALE, CA/USA: February 21, 2016- Spurts of red water in a colorful dancing water fountain at night add to the ambiance of an outdoor shopping center. Underwater lights illuminate jets of water. 4k00:30BARCELONA, SPAIN, CIRCA MAY 2015: Magic fountains on Montjuic mountain, brightly illuminated, night view, steadicam, dolly. hd00:15ALICANTE, SPAIN – JANUARY 6: Ferris wheel and other attractions during the night in amusement Christmas park Alicante city; on January 6, 2015 in Alicante. hd00:10LIMA, PERU - JUNE 4, 2015: People visit El Circuito Magico del Agua - park with a series of different fountains in Lima, Peru. hd00:11LIMA, PERU - JUNE 4, 2015: People visit El Circuito Magico del Agua - park with a series of different fountains in Lima, Peru. hd00:08MOSCOW - JUN, 12, 2015: Panorama of Olympic Stadium with people and girl running on screens on show Sensation. Sensation in Hyderabad was in open air format for second time in history of festival.